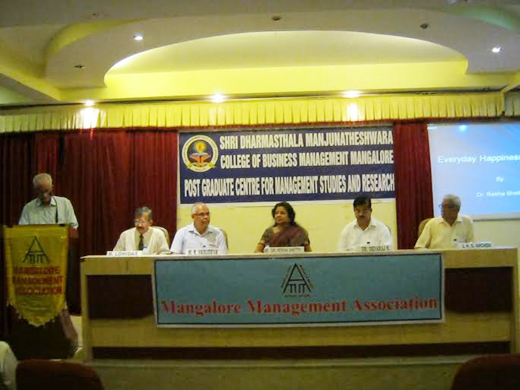 Mangaluru, May 19, 2015: MMA - Mangalore Management Association, had the good fortune of hearing a well reputed Author and management consultant/guru at SDM-MBA Conference Hall, M.G.Road, Kodialbail, Mangaluru on May 18. He ninth book, ‘Everyday Happiness Mantras’, was the focus. The members present were up beat at her spell binding talk with power point presentation and videos. Unfortunately the shipment of her book was not able to reach the city in time but will soon be available. MMA President Vasudev, Secretary Lohidas, key people Devaraj and Anchan were the main organisers while a good number was present and took advantage of the meet to interact with the famous writer and presenter. 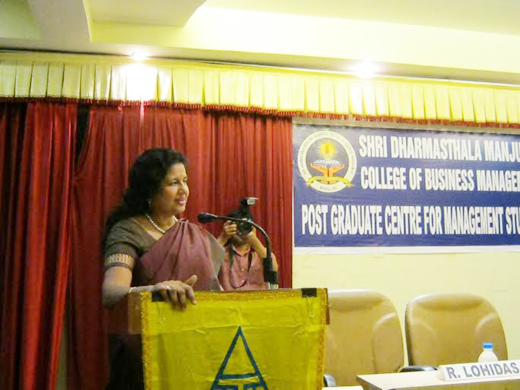 Dr.Rekha’s presentation gave a head start for the many Management buffs present. 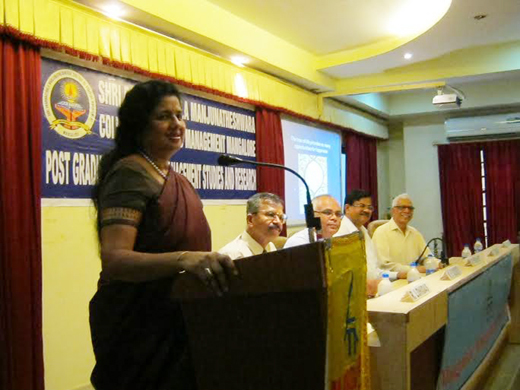 The seniors among them were given special insight into developing and evolving into 21 st century mentors. The ice cube and apple demonstrations gave an amazing insight to the participants. ’Social Capital’ has to be built brick by brick and developed all through life, not only GNP of a nation is vital but also GNH - Gross National Happiness. Take on the book ’ Everyday Happiness Mantras’ : The tree of life provides so many opportunities for happiness. Everyday Happiness Mantras is a book that lends itself to a refreshing classification of the things that could make one happy on a weekly basis. Divided into fifty-two articles for each of the fifty-two weeks of the year, the book concentrates on one home truth at a time—ranging from topics as wide ranging as the power of communication and everyday love, to something as specific as celebrating International Family Day and International Women’s Day. It is a book that celebrates age old truths and imbues them with newness. It busts stereotypes and gives a novel twist to old establishments like the family and the workplace, to show how they may be redesigned to suit the reader in the twenty-first century. Choosing to be happy is the name of the game and Happiness Mantras is its latest avathaar. Everyday Happiness Mantras, your very own guidebook to a good life, will stay with you, through the annual calendar and constantly remind you of the things that truly matter in life. Divided into fifty-two articles for each week of the year – this book concentrates on one home truth at a time observing each of which will ensure that you never have a bad day. Covering topics as varied as the power of communication and everyday love to the importance of observing the annual rituals of the International Family day a international Women’s day. Everyday happiness Mantras takes old habits and imbues them with new significance that gives them renewed relevance. If you are choosing happiness over everything else this year, this is the book for you. About Dr Rekha Shetty, PhD, : Founder of the Mindspower brand and is the Managing director of Farstar Distribution Network Ltd, a twenty-year-old consulting company working exclusively on innovation initiatives. She consults for some of the region’s foremost blue-chip companies. Keenly involved in social action, she is one of the first women Rotary International governors in Asia and a recipient of Rotary’s ‘Service above Self’ award. Her other books include : The Way to a Healthy Heart, The Zero Heart Attack Path, Portable Roots, Corporate Strategy: Mindspower Innovation, Innovate! 90 Days to Transform Your Business, The Happiness Quotient, Innovation Secrets of Indian CEOs, Innovate Happily and Innovation Sutra.